Which Countries Are Recycling Leaders? - Planet Aid, Inc. Which Countries Are Recycling Leaders? Germany, South Korea, Slovenia, and Austria are the world leaders in recycling, according to recently published data by the Organisation for Economic Co-operation and Development. 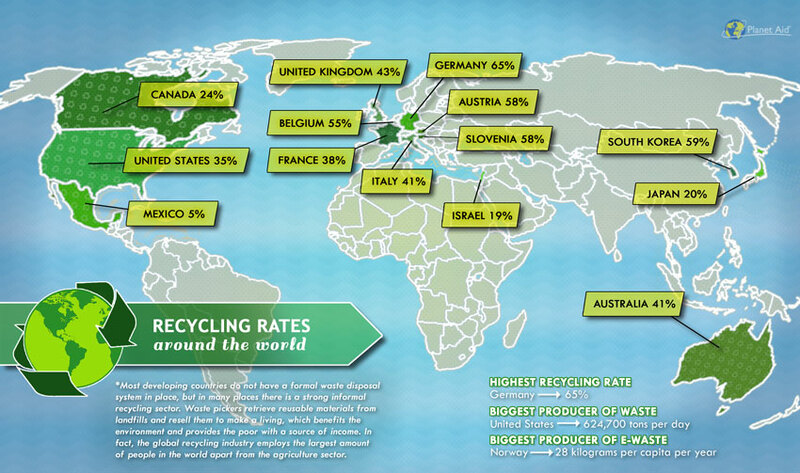 In all of these countries, less than half of the total waste output is sent to the landfill. In comparison, the United States recycles only 35 percent of its waste. Since our last blog post on the subject, Austria has been dethroned as the world's best recycler. With a recycling rate of 65 percent, the Germans now claim that top spot. Developing countries are not on the map because their recycling participation is difficult to gauge. Although most lack a formal structure to manage recyclable waste, many countries have an informal system in which people retrieve items from the landfills and sell them independently. Take a look at the infographic below to see where countries from North America, Europe, and Asia stand in their commitment to recycling. L Hoornweg, Danie, and Perinaz Bhada-Tata. What a Waste: A Global Review of Solid Waste Management. Rep. Vol. 15. World Bank, 2012. OECD (2015), Environment at a Glance 2015: OECD Indicators, OECD Publishing, Paris.